i hope everyone had a great weekend. i did. i was able to have dinner with mom on saturday and we went to a few stores and found something special that i will tell you guys about very soon. i also met some viewers of the nate show who also are fans of my design work. its always great to know your work is admired. here are 5 treasures i came across this weekend. i did an install on yesterday (sunday) and my client brought out this small 12 x 12 painting she picked up while in rhode island a few weeks ago. i think it is beautiful and has so many amazing colors and is truly a great starting point for any room. i did manage to work a small gallery wall around this which i am excited to share with you...very soon. i picked up 2 packs of merchandise tags (100 count each) from office depot before i jaunted to teach choir rehearsal back home. they were very inexpensive and i thought they would be excellent candidates for personalize gift tags. i will be sure to show you photos when i complete them. so im cheating a bit. i didnt score this vintage blazer this weekend, but its too amazing was to not to blog about. i actually picked it up earlier last week. in the words of jay-z, "it ain't for everybody." how great is this georges briard mirrored ice bucket? this iphone picture does an awful job of showing how beautiful it really is. i dont buy a lot of trinkets, so i figured i could treat myself to this one. its definitely barcart worthy. ever since this POST, i have received so many requests from guys wanting to obtain their own piece of this iconic and timeless fabric. 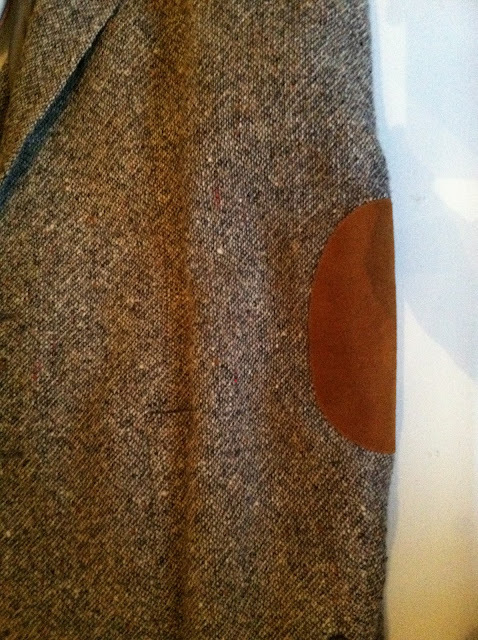 i came across this amazing speckled tweed blazer with arm patches, that was made in france. the construction is amazing. i especially appreciate side vents that begin at the same height of the side pockets. a number of modern suit's venting is just too short for my taste. hence my love for vintage wear. did you make any special purchases that just made you smile?